Forgiveness is not a feeling but an act of the will. I have yet to met someone who has not had to forgive or to be forgiven (most of us both!). Most would probably admit that in the case of forgiveness, most situations can be very difficult to face or wade through unscathed. The inability or the struggle to forgive can form barriers in our hearts which hold us back, bind us up, or even become all consuming. This is not the freedom, peace and abundant life that Jesus came to bring us. Forgiveness requires God’s grace to accomplish. When we cooperate with and allow God’s grace into our lives, it is far easier than you ever imagined moving beyond our pain. 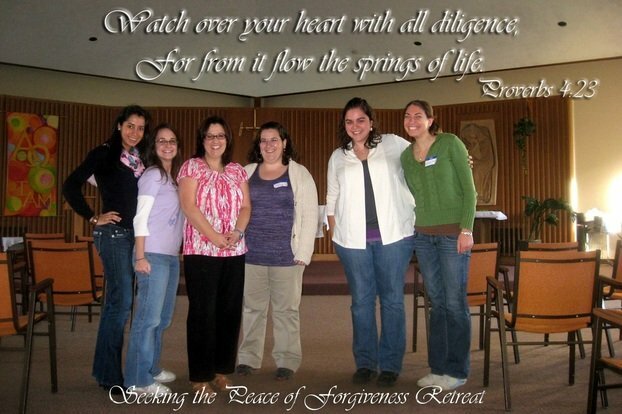 This retreat will help women begin to identify areas of non-forgiveness and provide many helpful strategies toward the process of letting go, forgiving and going forward.